The OxyPlate™ is changing the way today's clinical labs isolate and work with anaerobic pathogens. For microbiologists charged with growing anaerobes, OxyPlates™ bring a new level of convenience to a difficult job, and give microbiologists more control throughout the entire recovery process. No need to change current methods. OxyPlates™ are self-contained anaerobic chambers. They generate and maintain anaerobic environments .... again and again. The OxyPlate™ is incubated in a standard aerobic incubator. Each isolate can be handled individually and independently of all other isolates when using an OxyPlate. That isolate can be worked with when It Is Ready... not only when it is time to open the jar. OxyPlates frees you from the limitations of bags, jars, or anaerobic chambers. Think what this can do for work-flow and improved efficiency! OxyPlates™ for subbing can be used independently of the means used to set primary plates. Think of OxyPlates™ "in addition to" rather than "instead of" your current method. OxyPlates™ complement all existing methodologies. The OxyPlate™ meets both of these criteria. The OxyPlate™ generates its own anaerobic environment. It is not dependent on an external device to create anaerobiosis. The OxyPlate™ can be opened and closed, and it regenerates an anaerobic environment again and again. The medium in an OxyPlate™ is made PRAS. Because of The Oxyrase® Enzyme System, the OxyPlate™ comes to you reduced and ready to use. Oxyrase® is a dynamic reducing agent that keeps the medium reduced when it is opened in air. The OxyPlate™ has Best Practice built in. There is nothing extra for you to do or to supply, when you use the OxyPlate™. Could isolating anaerobes be simpler?
' Why PRAS Media' in the box below ( references provided on request ). 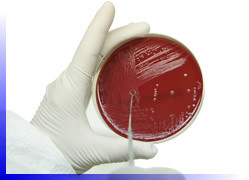 Working with anaerobes is perhaps the most time consuming and costly activity in the clinical microbiology laboratory. However, media cost is but a small part of this total cost. Does it make sense to invest in the laboratory equipment and supplies for anaerobes, train microbiology technicians to do the work, and then skimp on media to ' save money ' ? When considering cost for subbing anaerobes, take into account savings from the OxyPlate™ replacing the bag, jar, or chamber and the accompanying accessories. In addition, the OxyPlate™ improves laboratory efficiency. It makes working with anaerobes simpler. Simple saves time and money. Simple is better! Why Are OxyPlates™ Better for Anaerobe Recovery? The Oxyrase® enzyme removes oxygen from the plated media environment naturally, selectively and efficiently. 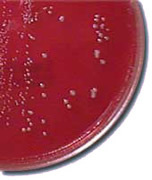 OxyPlates™ are capable of growing known clinical anaerobes. Compare OxyPlates™ to your current plates used to sub anaerobes ... you will notice the difference. OxyPlates™ are made for anaerobes using a biotech method that enhances the plates. They come reduced and ready to use ... there's nothing for you to prep. OxyPlates™are specially packaged in oxygen barrier bags to assure the anaerobic integrity of their environment during storage. OxyPlates™ can be stored in a refrigerator, dramatically extending their shelf life. OxyPlates™ are cost effective when all cost factors are taken into account. OxyPlates™ generate anaerobic conditions again and again. Test the performance of OxyPlates™ for subbing. We'll send you OxyPlates™ FREE...yours to test with no obligation. Click here to order your free test samples now. Or call 1-888-699-3733, ext. 225 to order your FREE test samples of OxyPlates™ immediately! For More Information about the OxyPlate™ including Product Insert, MSDS Sheet, and Formulation page Click Here. OxyPlates™ enhance the growth and isolation of anaerobes. OxyPlates™ come ready to use and stay reduced even after extended exposure to atmospheric oxygen. OxyPlates™ eliminate hassles you've always associated with anaerobe recovery. OxyPlates™ simplify the anaerobe recovery process. So don't delay. Order your free test samples of OxyPlates™ now. Discover for yourself the unprecedented convenience and control you'll get with OxyPlates™ used for subbing. Ready to try OxyPlates™ risk-free?